- The entire pump set remains permanently submerged and secure, without a food value, so lower water levels do not create problems. - The pump set works efficiently terminal is provided on the motor near the cable entry. We are offering high grade Submersible Pump, which are widely appreciated by our clients for their comprehensive functionality. These Domestic Submersible Pumps are precisely designed by our highly experience team of engineers using the advanced technology system to meet the international quality standard. We are engaged in manufacturering, supplying and exporting of 0.5 HP Openwell Submersible Pump. 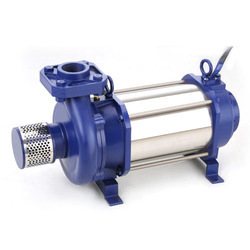 Offered openwell pump is developed using the standard quality components and advance technology. Our entire range of openwell pump is highly acknowledged in the market for its standard quality & consistent performance. We offer wide range of horizontal open well pumps which are at par with international standards. These pump sets work under water and never dry run. Manufactured using graded cast, the pumps are treated with special coatings to prevent rust formation thus, increasing the life of the pump. Our Horizontal Submersible Monoset is notable for its quality, dependability, and magnificence for all sort of administration reason. Different Level Monoset are produced under the supervision of exceptionally qualified specialized group with a phase savvy unbending review strategy under TQM ideas. OpenweII submersible pumps are replacing ...gal pumps at a number of places beceuse of some of te inherent advantages.such as. - Head 8 to 38 m.
- Capacity 11 to 0.4 LPS. - Power Rating 0.37 to 1.5kW (0.5 to 2.0 HP). We are among the foremost Manufacturers of an innovative range of Open Well Submersible Pumps. 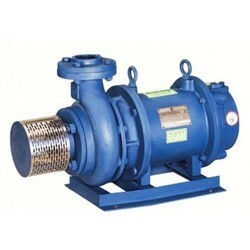 These Pumps are manufactured using optimum quality raw material and latest technology. The Open Well Submersible Pumps offered by us is well known in the market for its high strength and sturdy construction.